Happy second Wednesday of the month! 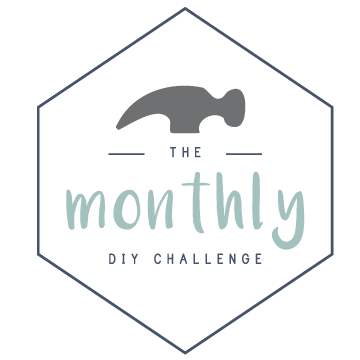 You know what that means – Monthly DIY Challenge time! Woot! For February our theme is metallic paint. There is so much you can do with paint. Add in metallic and that just jazzes things up even more. I decided to try my hand at some copper dipped planter pots, because I had a few old terracotta pots laying around that looked like they could use some pizzaz. And also I just love me some copper. First, I wiped down my pots to give them a clean slate. With painter’s tape, I taped off the top rim of one pot and the bottom part of the other. Next I sprayed the untaped area of the pots with copper paint. Once that was dry enough to handle (2 hours) I removed the tape and placed new tape around where the copper paint edge was. I brushed the white chalk paint on the unpainted parts and let that dry for another couple of hours. The last step was to fill my pots with pretty flowers and enjoy! These pretty darlings are white cyclamens. I love the simplicity of this project! Be sure to take peek below at the other lovely projects in the challenge! I’m really digging copper these days – the warm hue just plays so prettily with so many colors and finishes! And I definitely can’t wait for all the spring crocuses to pop up in the yard – come on spring! Me too! I just wish our spring lasted longer than the month of April, LOL. I bet it’s gorgeous up there in spring time! Thanks, girl! It’s definitely grown on me over the years. This is the perfect project as we approach Spring! I love copper SO much! Beatiful quick DIY! Thanks, Lindi! It was so easy and it’s just so darn cute!